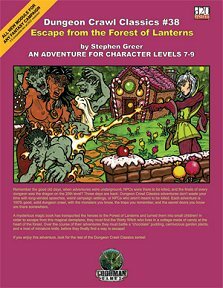 An adventure for characters of levels 7-9, with some strange twists. Publisher's blurb: "A mysterious magic book has transported the heroes to the Forest of Lanterns and turned them into small children! In order to escape from this magical demiplane, they must find the Warty Witch who lives in a cottage made of candy at the heart of the forest. Over the course of their adventures they must battle a chocolate pudding, carnivorous garden plants, and a host of miniature trolls!"